Don’t you love Summer? There’s nothing like the laid back days and stress-free schedules of easy living. 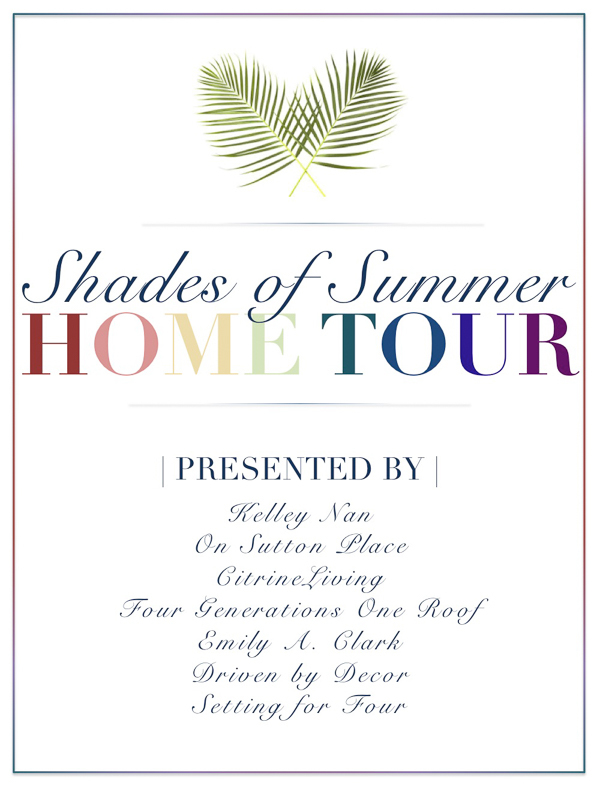 Welcome to my Summer home and the Shades of Summer home tour – I’ve teamed up with a very talented group on this tour – you’ll be so inspired to bring Summer into your home by the time you’re finished visiting all the tours! You can find all participating bloggers linked at the bottom of my post. 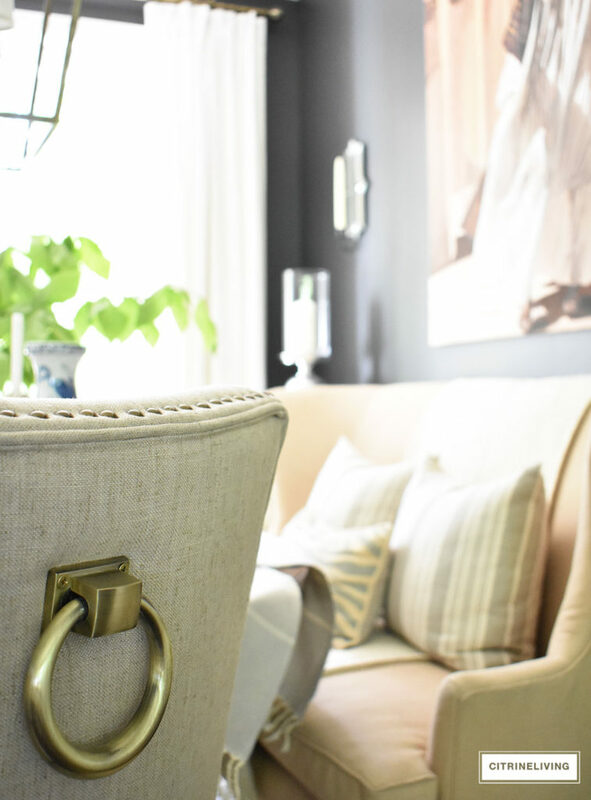 If you’re new to my blog and visiting from Ann of ON SUTTON PLACE, I’m so happy you stopped by…I love welcoming new readers to CitrineLiving – I hope you enjoy my home and blog and stay a while! If you’re a regular visitor, you know how much I love to have you here! 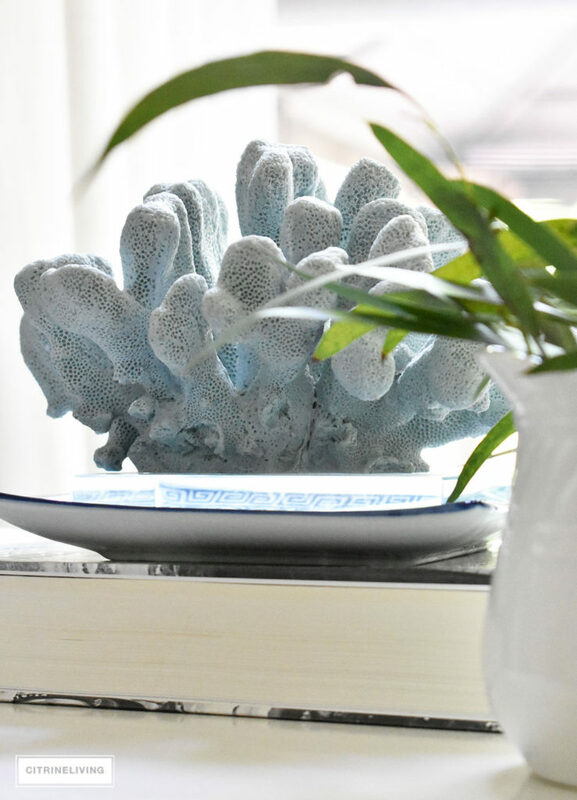 I’m so excited to share how I’ve brought some summer touches to our home. 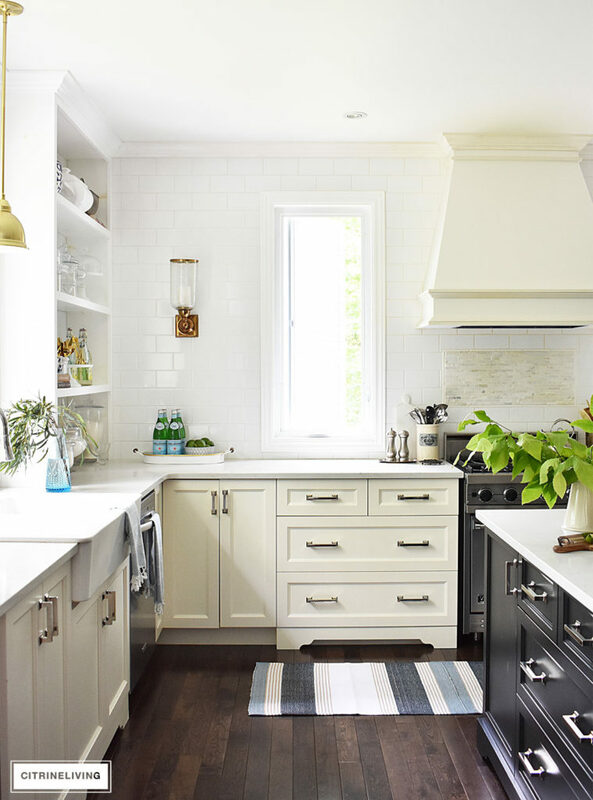 As a blogger, it can be challenging finding new ways to reinvent our homes to bring you freshness with each new season. 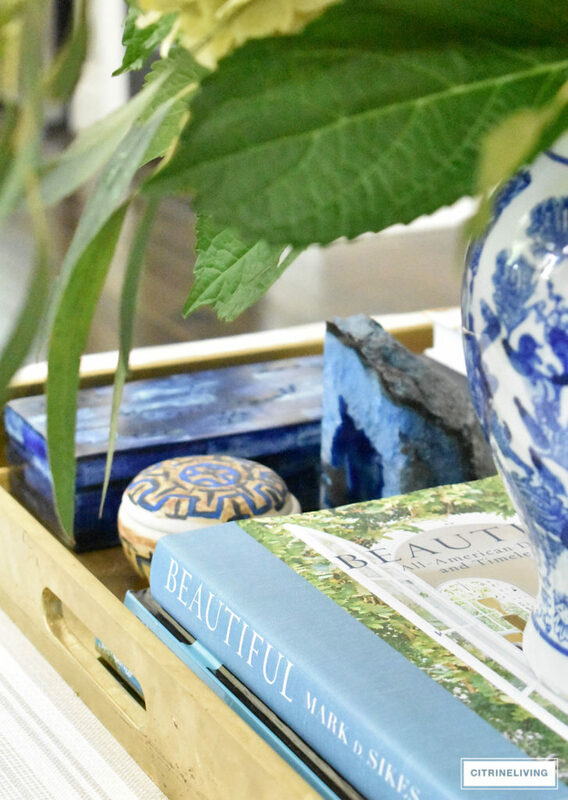 Since blue has become a signature color year round in our home, I decided to keep my color palette and layer verdant touches to celebrate the season and the surrounding outdoors, with layers of beautiful blues and fresh greenery. I hope you enjoy and get inspired! I have to start off with an apology! My camera is in for repair and I’m using one that’s on loan – I had so much trouble with the lighting – please excuse the image quality and grain in some of my shots! This is the view from the front door as you enter our home. We have an open concept floor plan, and most of our living spaces are visible to one another. 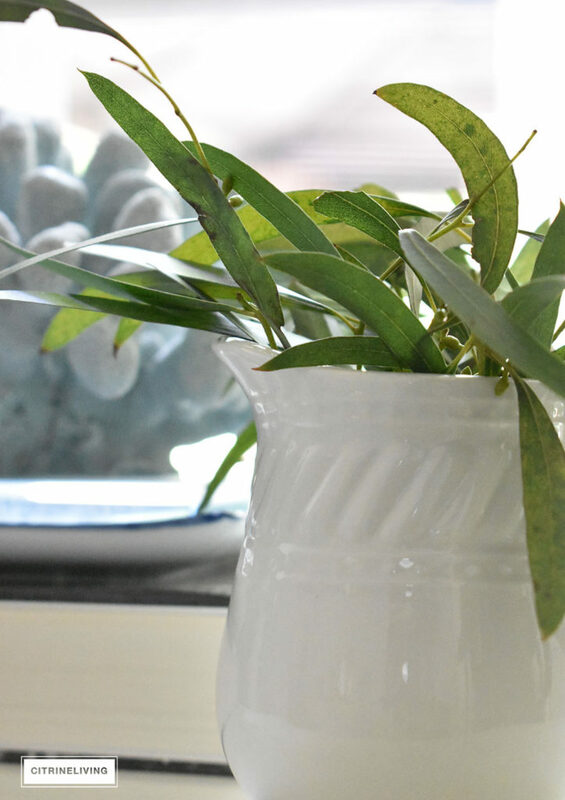 I’ve been building my collection of blue and white pottery for about 4 or 5 years now, and I love to add anything to the roster that I can use on tables, shelves, bathroom counters, dressers, you name it. 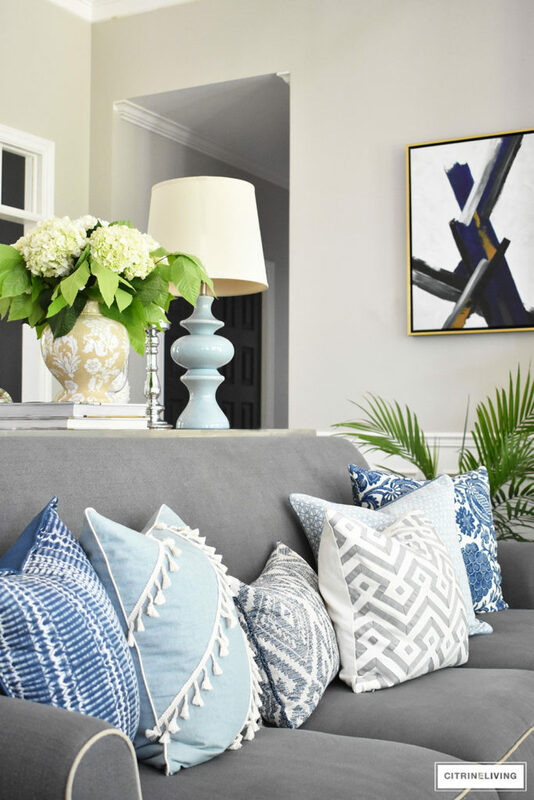 Blue is such a versatile color and is a neutral, and although it adds punch, it goes with any other color (as all colors do) and is always soothing to the eye. 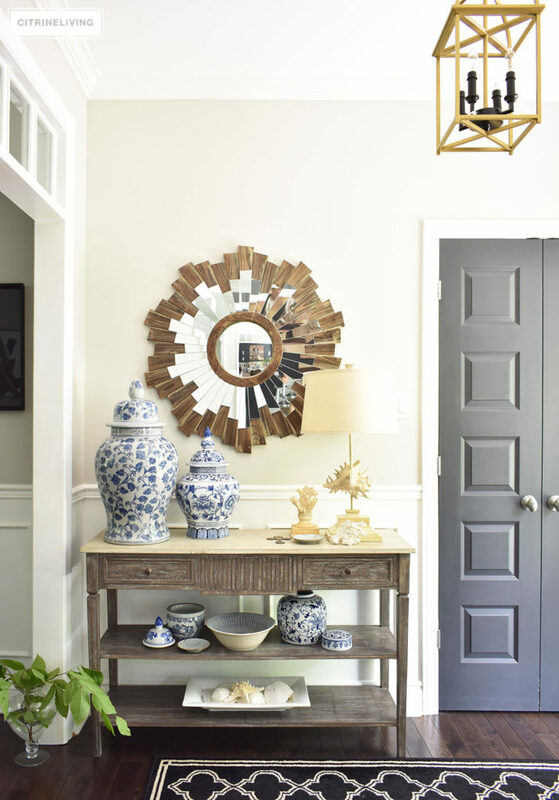 I’ve kept some of my blue and white pieces on our console table since February (I had mostly neutrals in the Fall and Winter) – I didn’t change much except add some new pieces and bring my conch shell lamp out of storage for the warm months ahead. I also tried a few different floral and greenery arrangements in here for these shots – something about the simple fresh cut greenery speaks to me…which one is your favorite? Sand dollars, shells, coral and starfish greet you as you walk through this space, into our home. 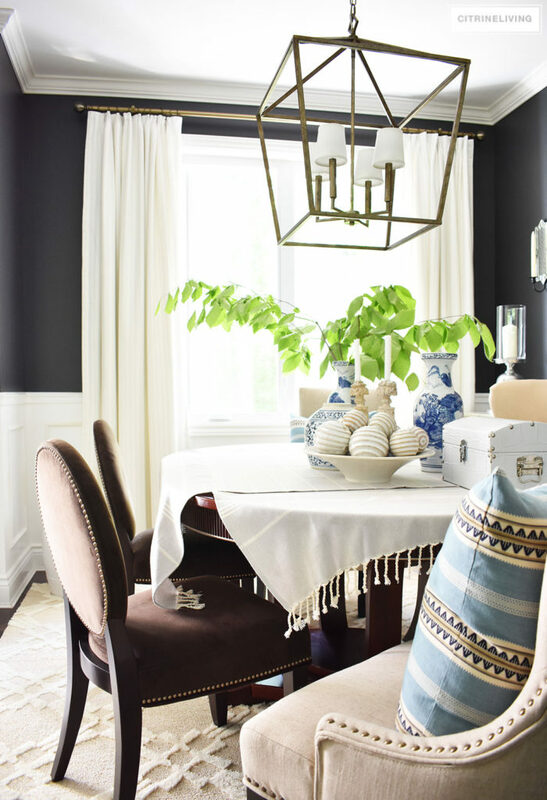 I love to reinvent the look on this table, but time and time again, I come back to using this palette. 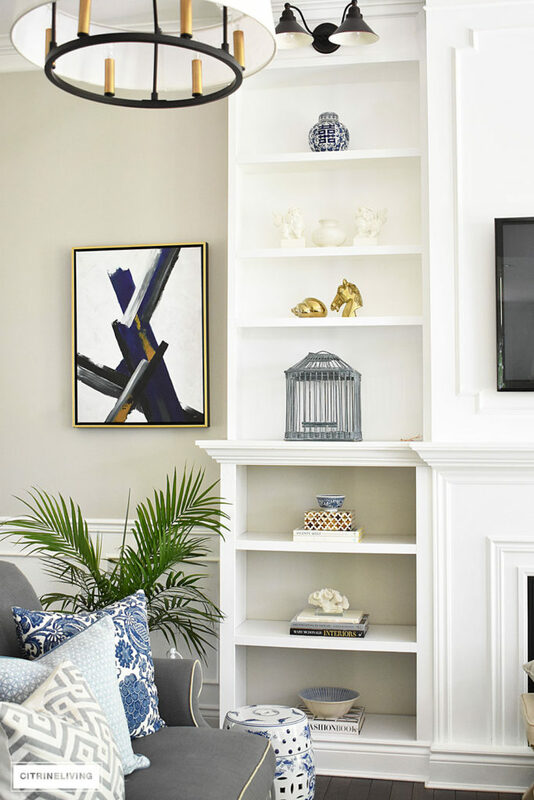 You can read my post on 4 different ways to style a console table here – it’s full of many great tips, you’ll love it – I often will use it as a reference for myself! 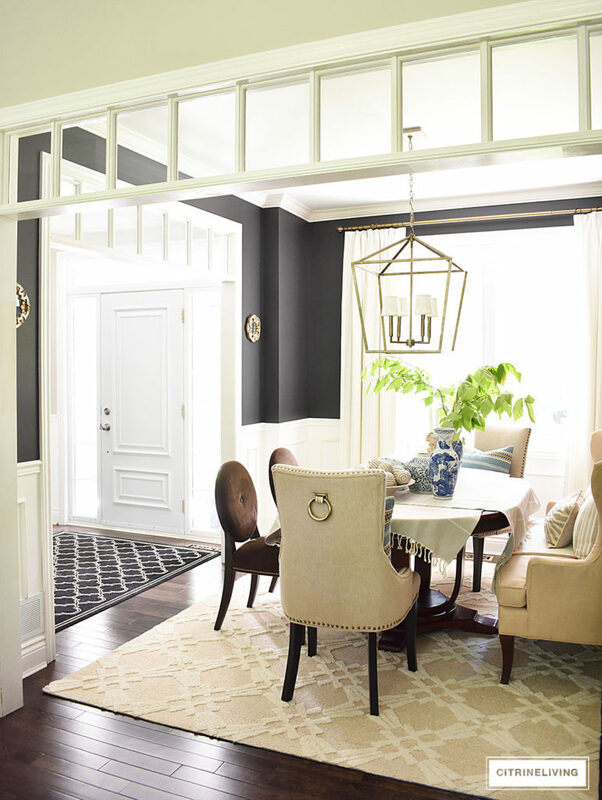 Let’s move over to our dining room, which is on the left of our foyer – again, an open concept space that helps to enlarge our home visually, and it also helps with the addition of natural light. I’ll start off by talking about our new chairs I recently purchased – many of you know I’ve waited seven years – yes, seven long years for chairs to finish off this space. Although they’re not the style I was looking for, they were too good of a deal to pass up, and I am seriously in love with their classic, timeless style and elegant detailing. I’ll come back to that in a minute. My gorgeous, new, pinstripe custom drapes, also from Tonic Living. I couldn’t be more impressed with their service and the quality. This fabric is called Montauk Stripe in Natural, backed with dim-out lining, finished with a top pinch pleat for a crisp and classic tailored look. We had basic Ikea drapes here previously, which were great and very affordable. 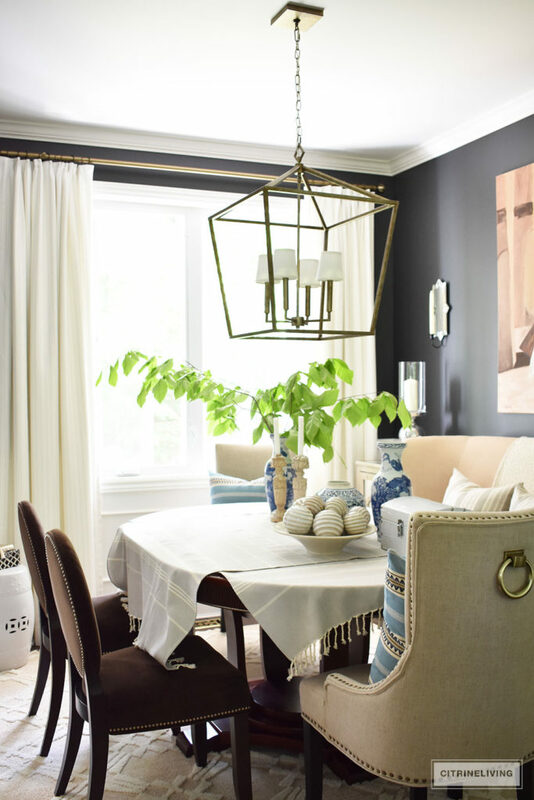 But nothing is quite like a custom pair of drapes and these suit our dining room perfectly. 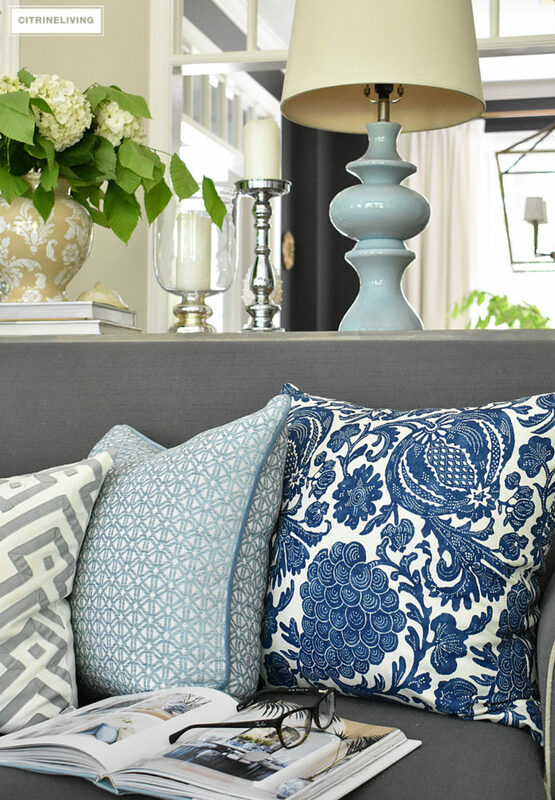 You can learn more about Tonic Living’s custom sewing here. Now back to the chairs. As soon as I saw the antique brass ring pull on the back, I got weak in the knees! Nailheads, antique brass, linen…sold! 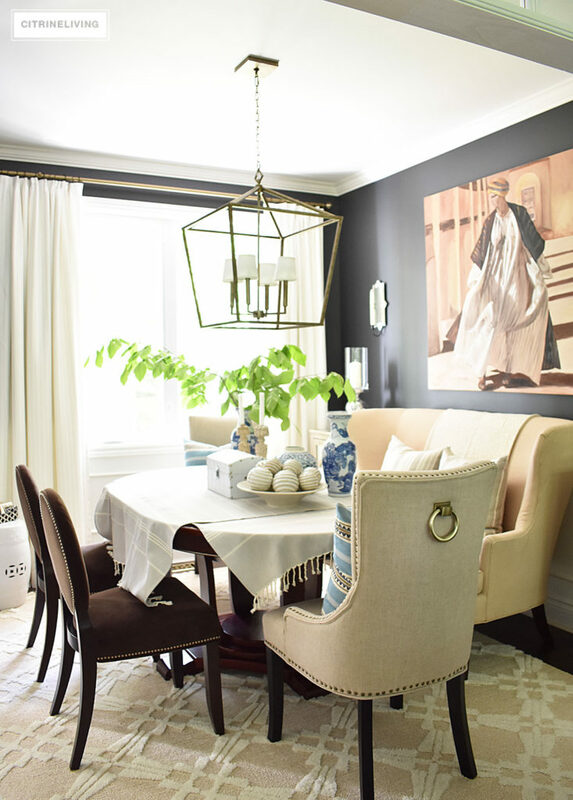 The tailored styling and rich details were the perfect addition to our dining room, and they compliment the other upholstered pieces beautifully. 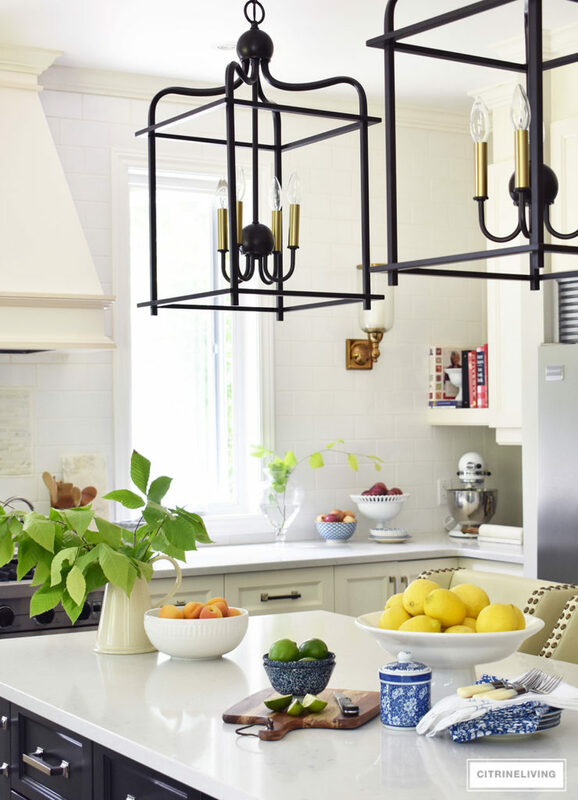 It’s amazing how small details make me so happy – but details are the icing on the cake, and these add just the right touch of bling without going overboard. I kept the decor in here simple, with only a few subtle touches of the season. I went with greenery on a large scale to make a bold yet understated statement. 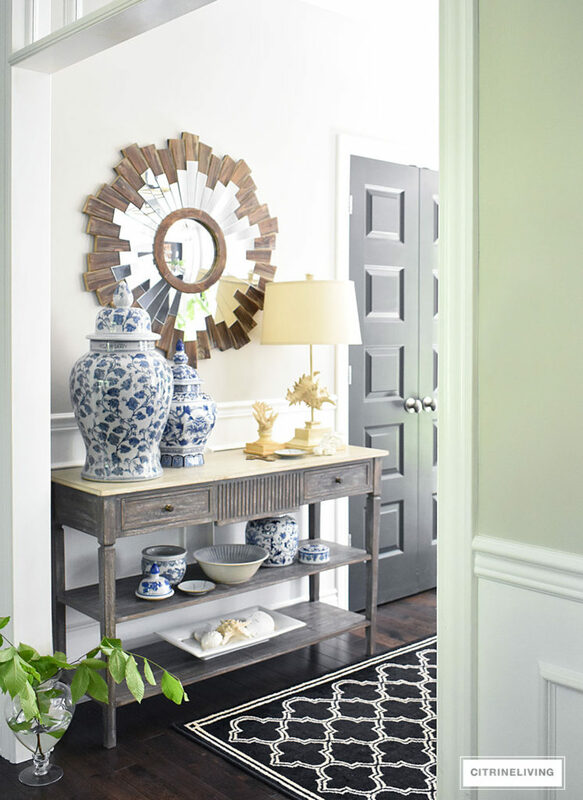 Layered textures along with the blue and white pieces allows your eye to wander around to the different objects, and creates visual interest. Also visible from the entrance is our living room, and yes, I have something new in here too! Our long awaited living room lights have finally arrived and we couldn’t love them more! 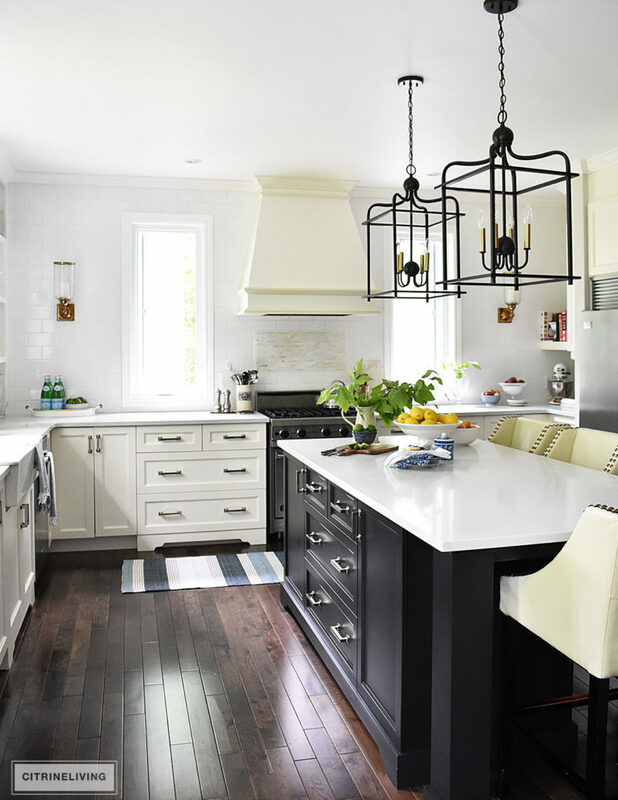 I wanted a whole different look than what we previously had in here – something clean-lined and sleek, but with a nod to the traditional at the same time. 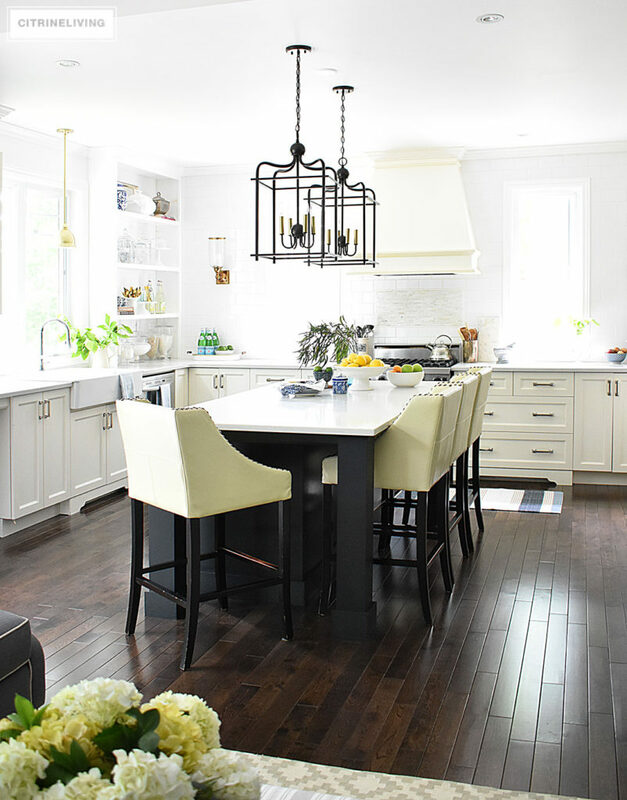 These are the Cherish pendant lights from Progress Lighting – they come with a black candle option, as well as brass, which is so great, if you want to change up the look in your room! I love them. Click here to see them. Now let’s talk more about my Summer touches. Building on the blues I already had, I wanted the pillows to feel casual and comfortable, and since I moved some of the others to the dining room and bedroom (you’ll see that further down), I decided on a layered, mixed approach, for a relaxed vibe. 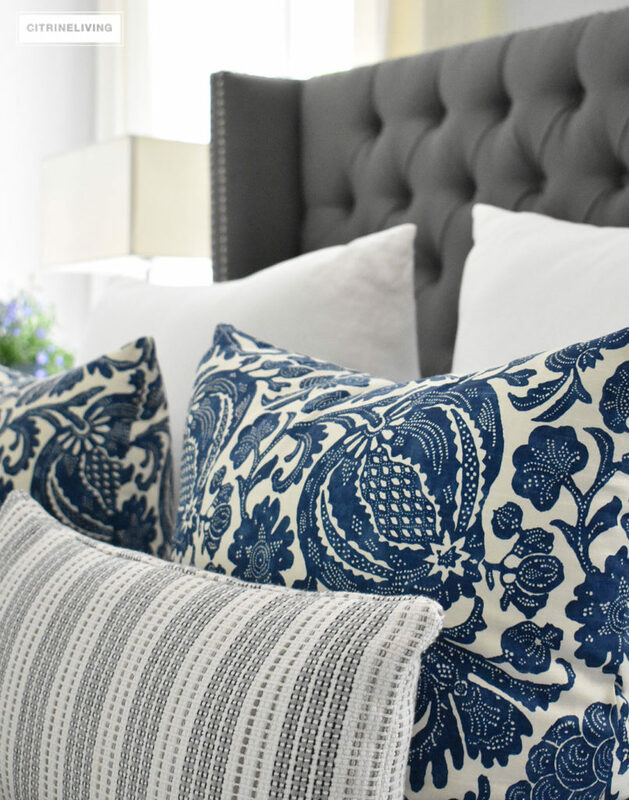 Below is another new favorite pillow from Tonic Living, and they look gorgeous anywhere I put them. Find them right here. 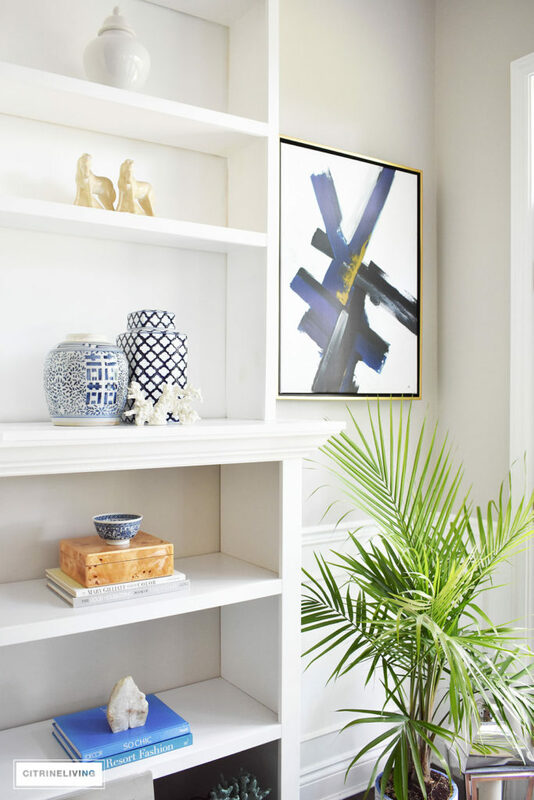 Palm plants, hydrangeas and more fresh cut greenery from the yard bring Summer to this room, and I am in love with all the vibrant hues happening in here. This is the first time I’ve ever owed palms – they’re for the back patio makeover we’re working on – stay tuned for that one, coming a little later – and they’re amazing in here too. I’m praying I can keep them alive, I have no green thumb, that’s for sure! You can see a sneak peek of our makeover on my Instagram account, here. I added more blue accessories to our otherwise neutral shelf decor. Even though the room appears large, due to 11 foot ceilings, it’s not huge and we have a lot large pieces in here. To keep the ceiling-height shelves from looking overwhelming and cluttered, I keep the look clean and somewhat minimal. We built these shelves when we built our home, and last year, we added on to them, which was one of the best decisions ever! Click here to see what it looked like before and tell me if you agree! 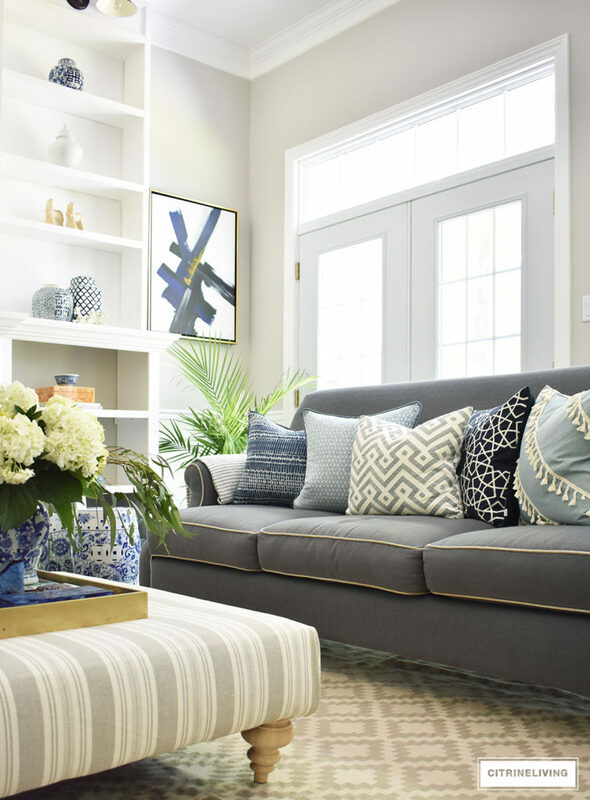 I used the same mix of pillows on both sofas, with one different pattern on each, to keep the vibe more casual and laid back. 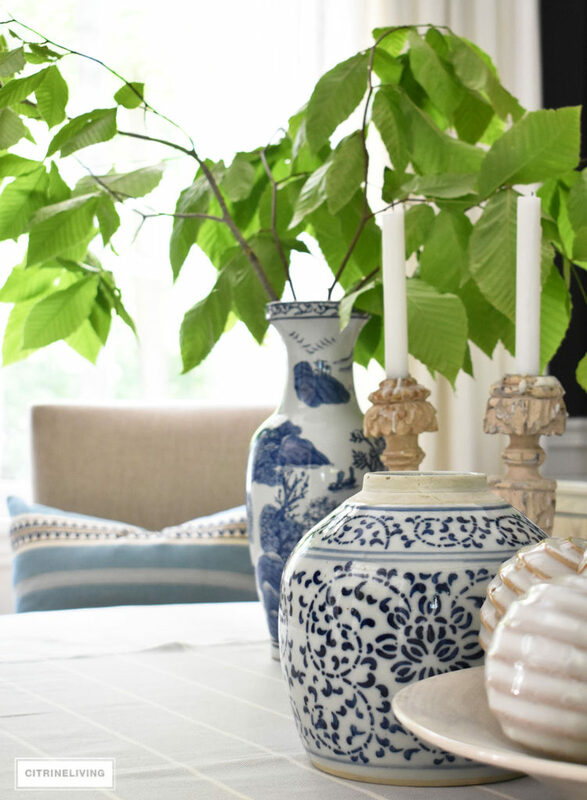 I love hydrangeas and use them year round and no matter what, I think they’re most beautiful in a blue and white ginger jar! I keep some of my favorite design books on our ottoman and I don’t know about you, but I’ll reread many of them several times when looking for ideas. Design books look beautiful, act as the perfect riser to display objects and you never get tired of reading them. Beautiful, by Mark D. Sikes, is one of my favorite designers who inspires me daily. This book is never ending inspiration and I can’t wait for his next one. Coming back to our buffet and the transition space between the hallway and living room, I kept the accessories silver and glass, for a lighter look. Two more of my favorite books by more of my favorite designers! You’ll see all of my books reappear all over the house. In our kitchen, I added some fresh produce in bowls and more cut greens. A few bottles of classic San Pellegrino always adds a touch Summer for that party-ready look. 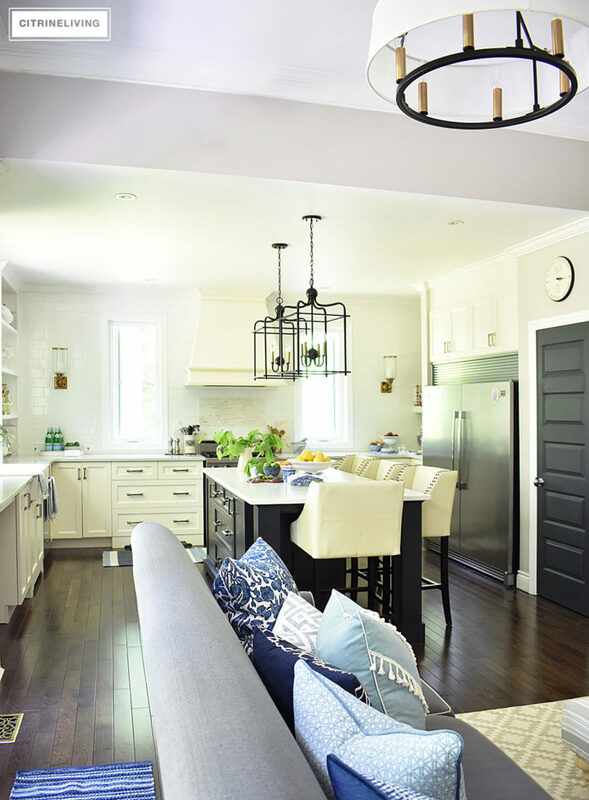 I added a blue and white striped runner along with some turkish towels (my latest obsession) and am in love with the light, coastal vibe they bring. Fresh produce is such a simple and inexpensive way to bring in the season, I can’t get enough of the vibrant colors. I use a lot of lemons and limes and I love having them displayed in here. Some do end up getting thrown out, but I try to use as many as possible, and I’m often restocking these bowls. 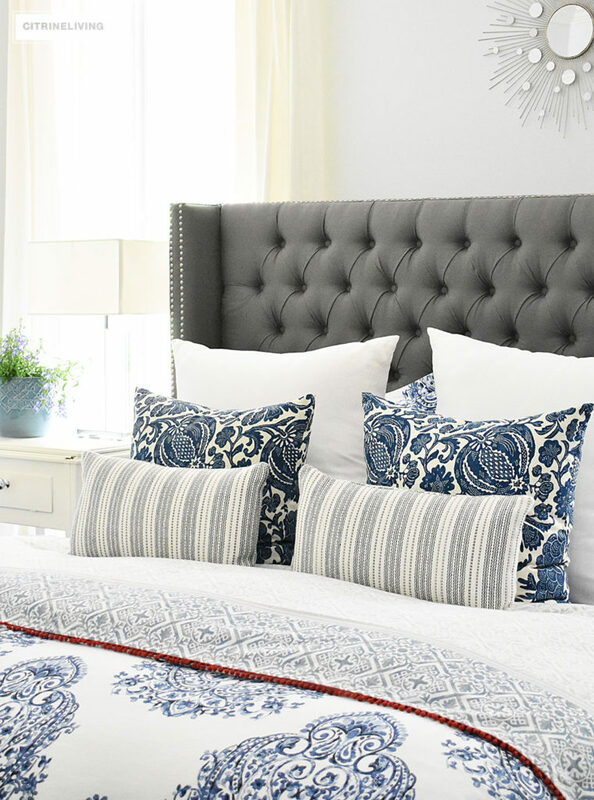 Our master bedroom hasn’t changed much since the Spring – I use different bedding in the Fall and Winter, you can see what it looks like here – but I wanted use something to speak to the season, and build on the coastal elements I already have going on in here. I added two of my blue and white batik print living room pillows (I have four) and layered them with these cute little striped ones. 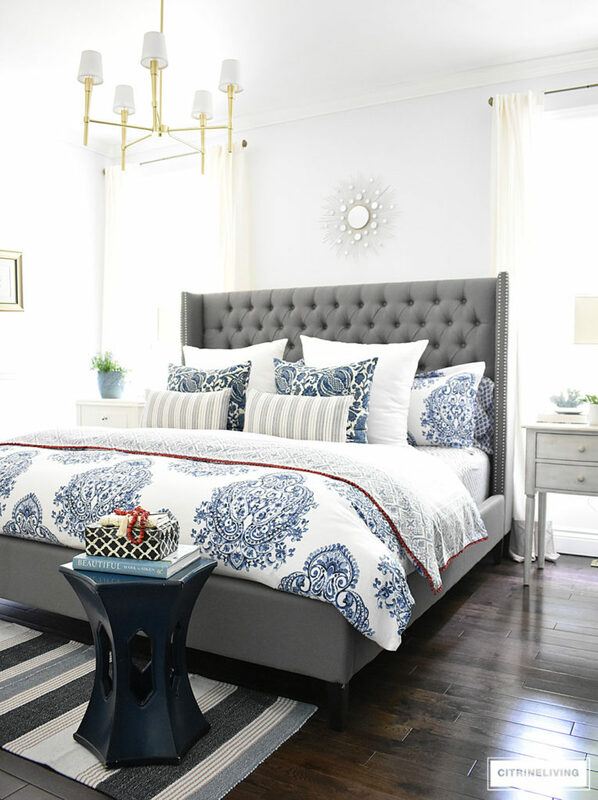 The rug is the same as in the kitchen – I ordered another one for our bedroom, the colors and the casual vibe are perfect in here. I also added another textile on top of the duvet, to mix up the patterns even more. I love the mini pompom trim, and the beautiful deep red hue. Would you even guess this is a tablecloth?! When I stumbled upon this beauty I think I jumped for joy, I instantly knew I would use this in a multitude of ways. 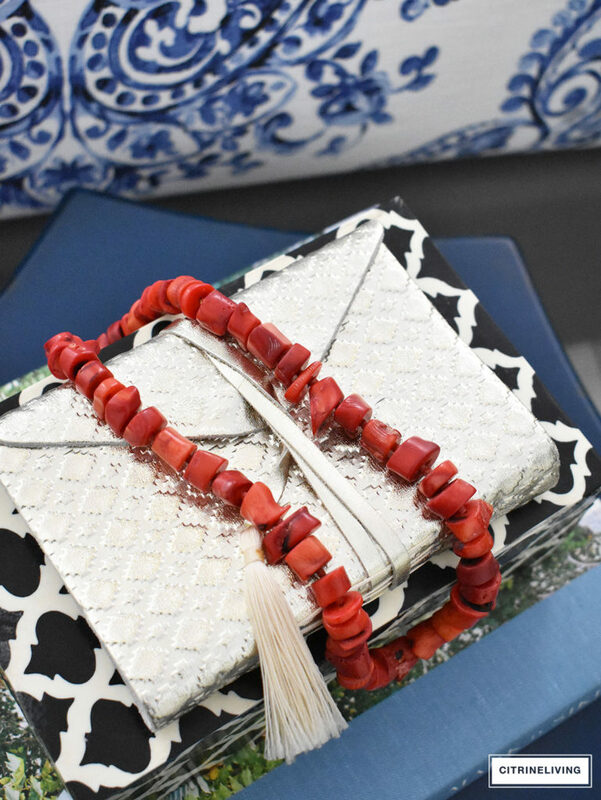 I used my chunky coral necklace to play off the deep red of the trim. 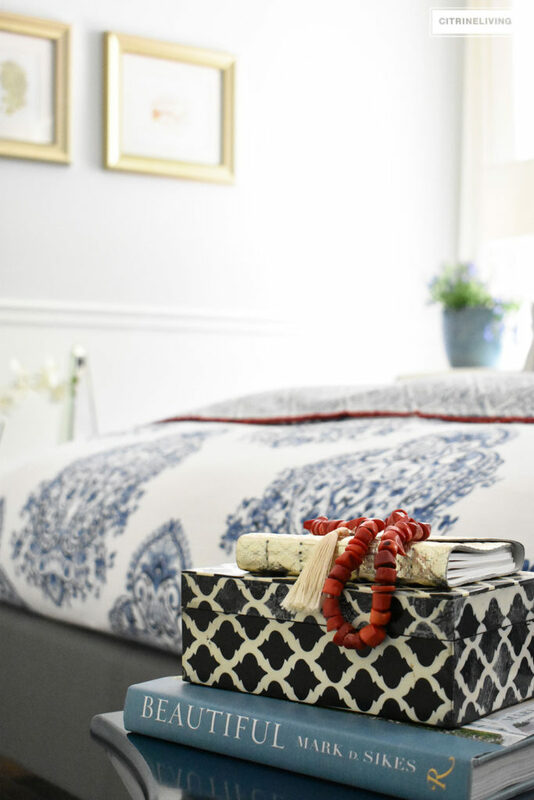 Displaying jewelry and fashion accessories is a great way to add personal, curated look to your bedroom. I’m all about mixing different patterns together, and I get so excited when a vision comes to life! I’m always moving things from room to room and trying them in different ways. 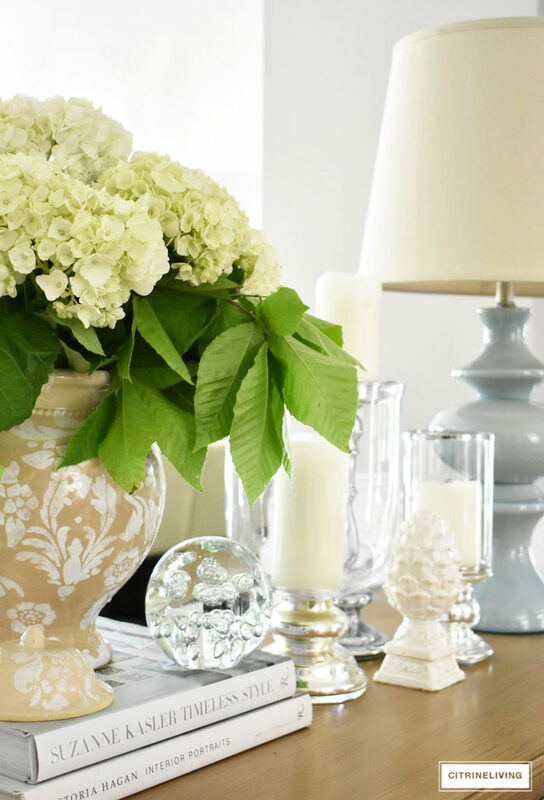 Don’t be surprised when you see this new piece on a tablescape! Of course, my favorite book found it’s way into this room for this shoot…the color was perfect as an added layer of blue. Next on our tour is Jessica, of FOUR GENERATIONS ONE ROOF – just wait until you see her gorgeous Summer decor! I’m dying over her great grandmother’s blue willow china! I’ve linked to all of the fantastic bloggers on this tour below – please make sure to hop over to everyone’s blogs for endless Summer style and inspiration. 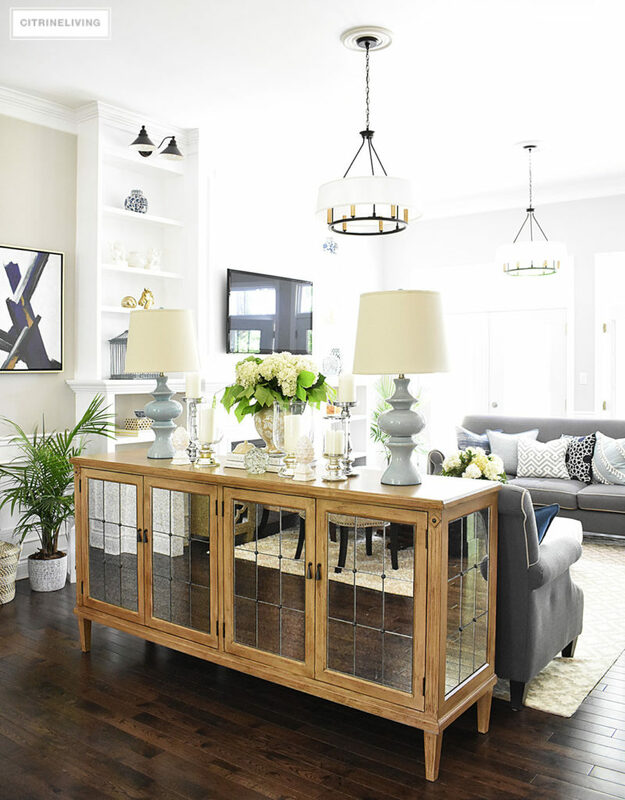 GET THE LOOK OF MY SUMMER HOME BELOW, BY CLICKNIG ON THE BOTTOM OF THE THUMBNAIL IMAGE. *A very big thank you to Tonic Living and Progress Lighting! I have received product in exchange for writing this post, however all products were chosen by me. All photos, writing, opinions and reviews are solely my own – as always – I only endorse products I want to use myself and that I know I will truly love! « TOP PICKS FROM THE NORDSTROM HALF-YEARLY SALE! what a gorgeous home! 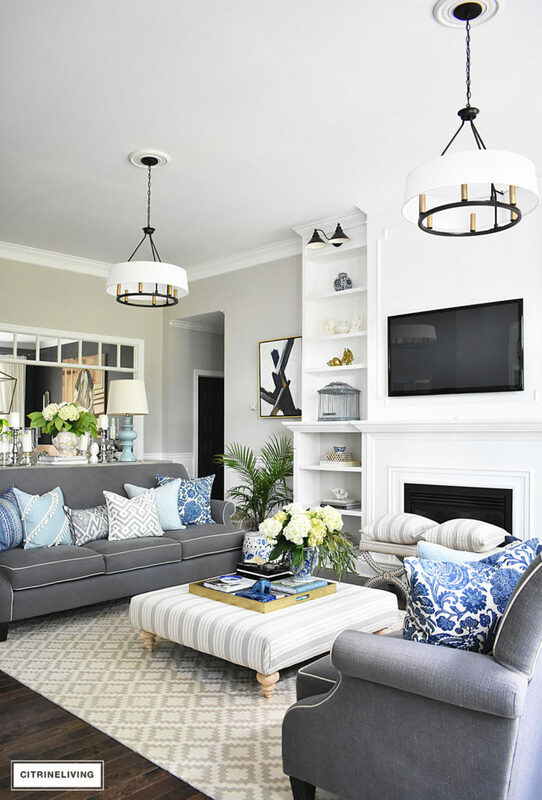 i love all of the blues, and especially love your living room! 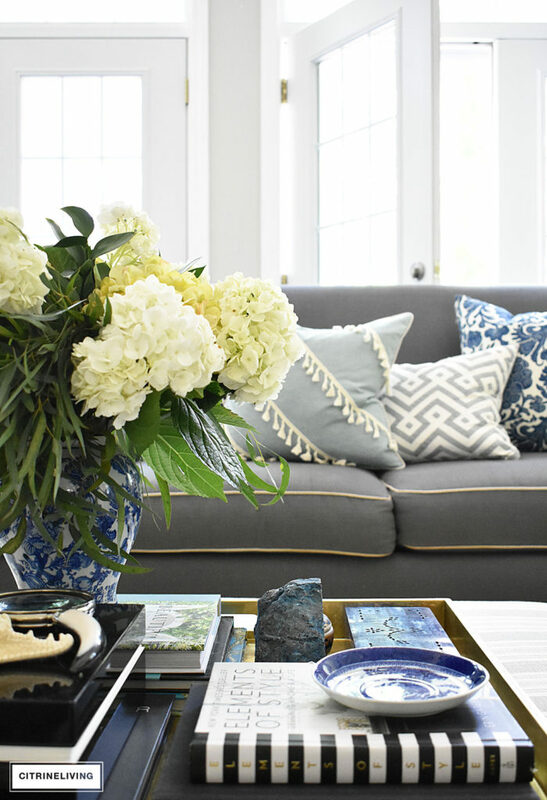 the coffee table and pillow mix are perfect! Tamara, thank you for sharing your beautiful home. Everything is gorgeous. 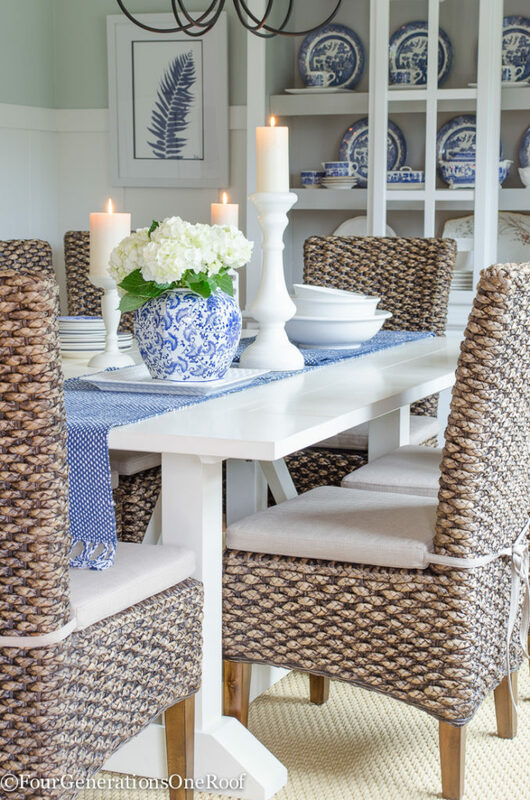 I have always loved your home, and your summer touches are perfect! I have a question. 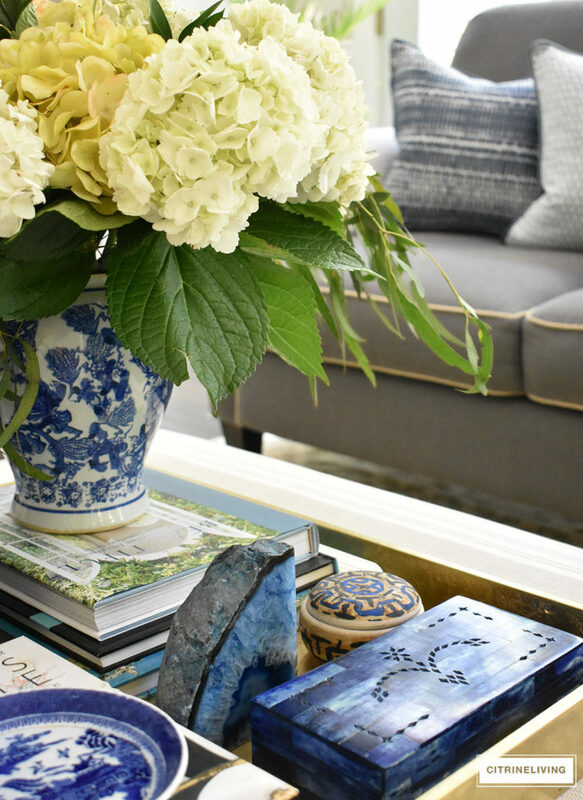 Can you tell us the source of the little round box on your coffee table? It’s so pretty! As I was taking your tour, each picture just got lovelier. 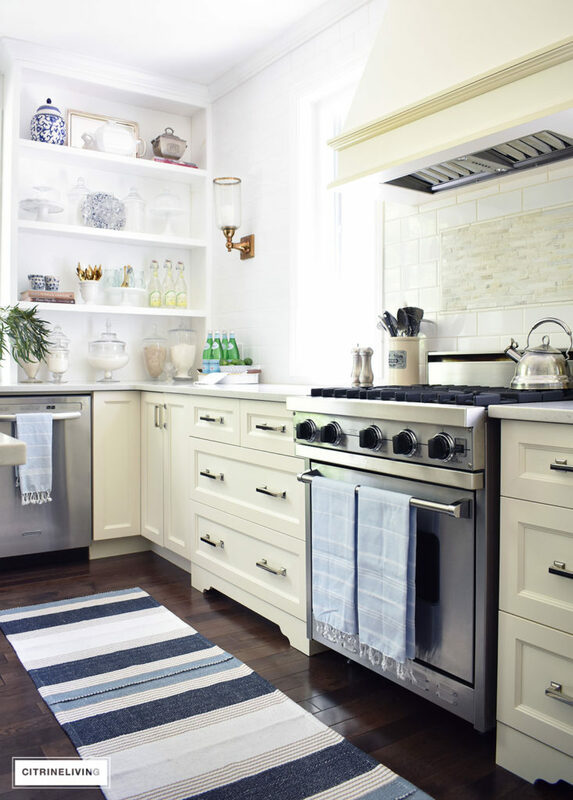 Your home is truly inspiring and classic. I especially like your rugs, lights and the way you layer everything. Now you can sit back and enjoy the summer! Ann thank you! I know you have a love for the blue the way I do! I’m so happy you like everything, I am so flattered! Now, I just hope the weather will get warmer so it actually feels like Summer here! I adore what you did with this Summer Tour! 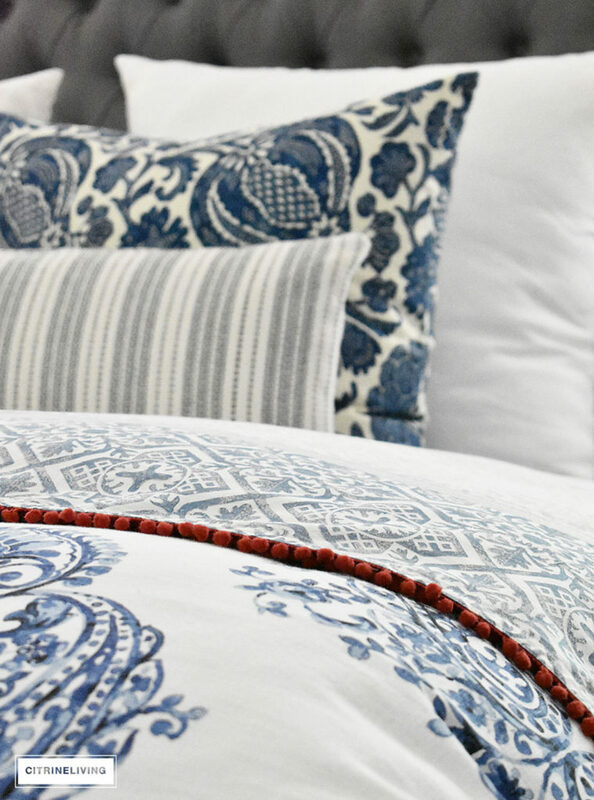 The vacation vibe it provides is perfect for a staycation;) You never want to leave the house. I just love your design style. You are truly talented. Thanks for sharing all these goodies. Beautiful home! Enjoyed the tour thanks for sharing. Thank you so much! So happy to have you stop in and say hello! Happy Summer! Looks gorgeous, as always! 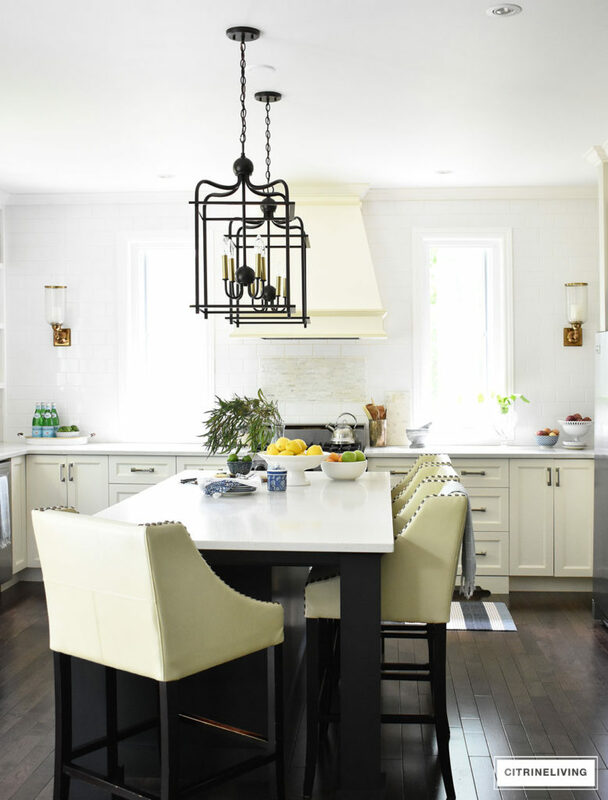 Those dining chairs with the ring pull are definitely stunning! 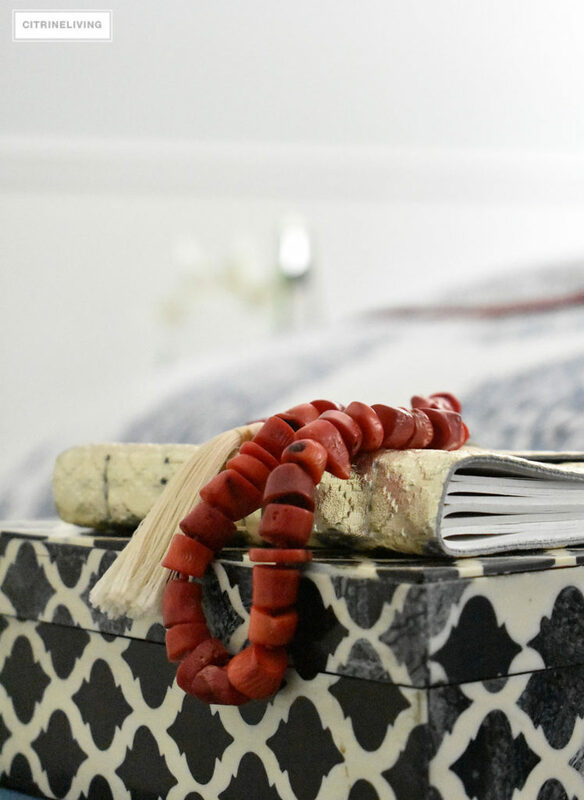 And I love the hint of red/coral in your master bedroom. Happy Summer! 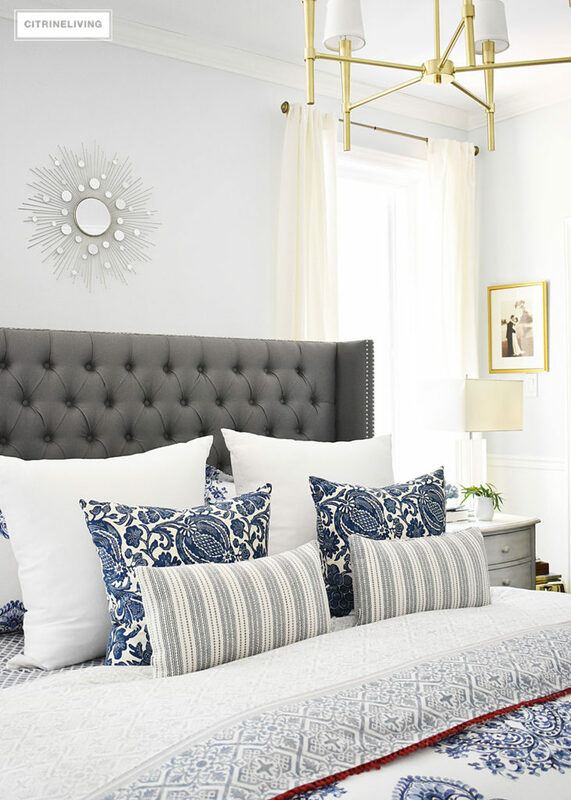 I love your new lighting, blue vases and gorgeous pillow accents!! 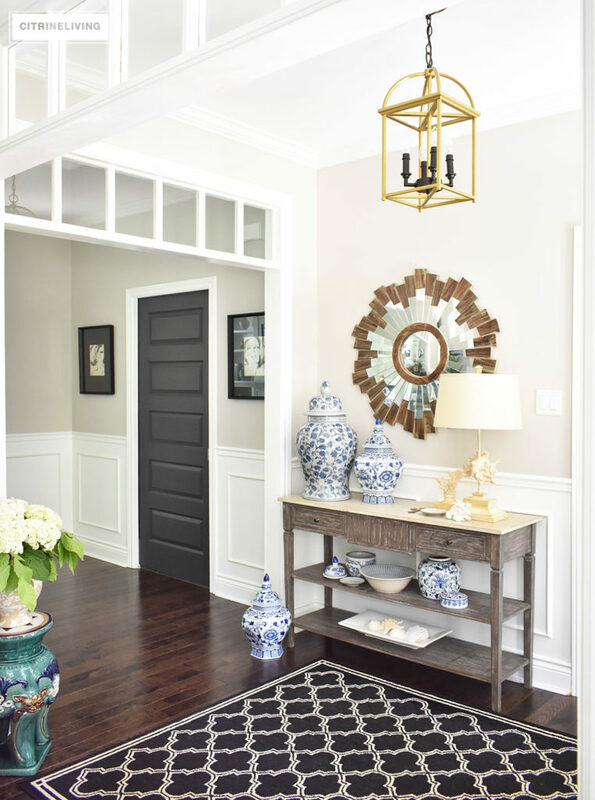 Your home is so stylish and inviting! So fun to be on tour with you and HAPPY SUMMER!! 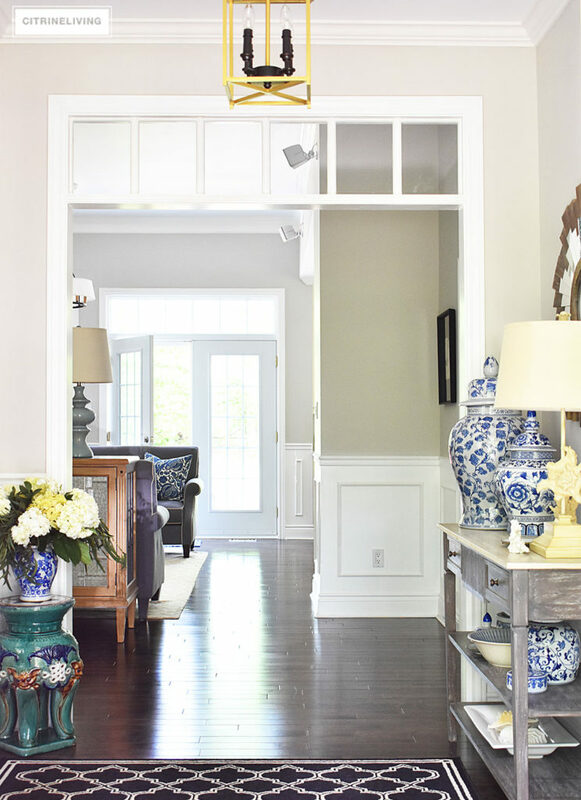 the house looks amazing from start to finish….i love the light, spring, airy feeling throughout!! Tam, goodness gracious at all of those amazing updates! You have been busy, sweet friend. 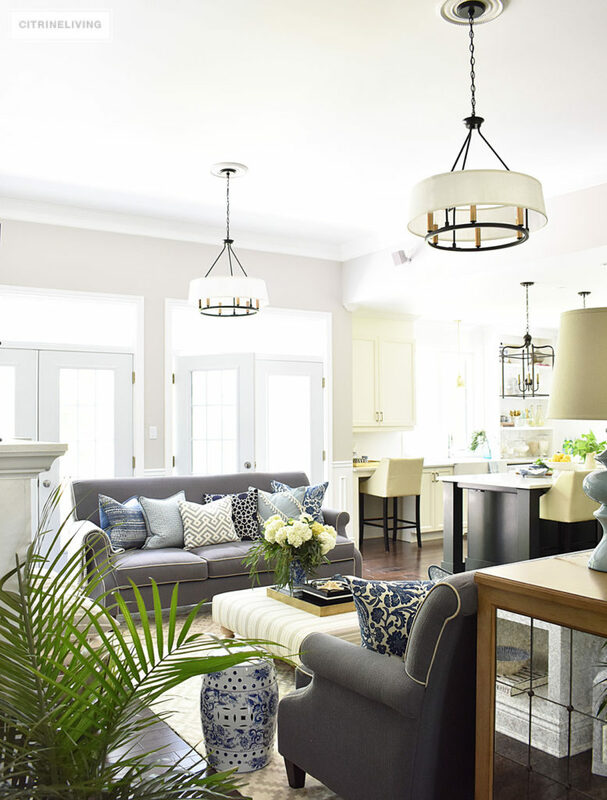 I can’t pick a favorite- congratulations on whipping your gorgeous place into a summer-ready haven for your family. Everything is AWESOME! Tam, everything is beautiful! Love all of your summer touches! That living room of yours gets me EVERY SINGLE TIME! I just love it. Everything looks gorgeous ! Have a wonderful weekend Tamara! So funny – I was just about to say what Jessica said – your living room SLAYS me – love every single thing about it! 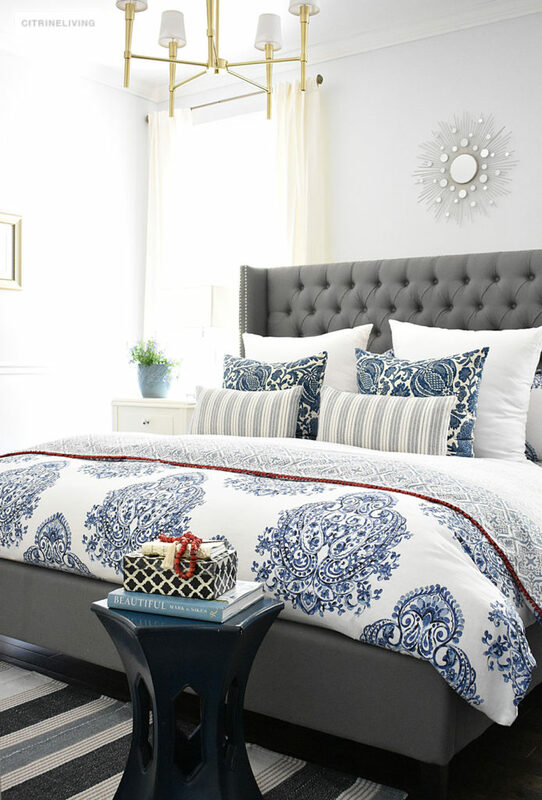 You know I love all of your blue and white goodness – it’s perfect for summer with your added touches! SO fun to do do this tour with you my talented friend!! Your home is absolutely gorgeous, great job. I pinned your living room lighting for a possibility in my home in the future, Enjoyed my visit!! Such a beautiful home. Thanks for showing it to us! Love love your home and colors. 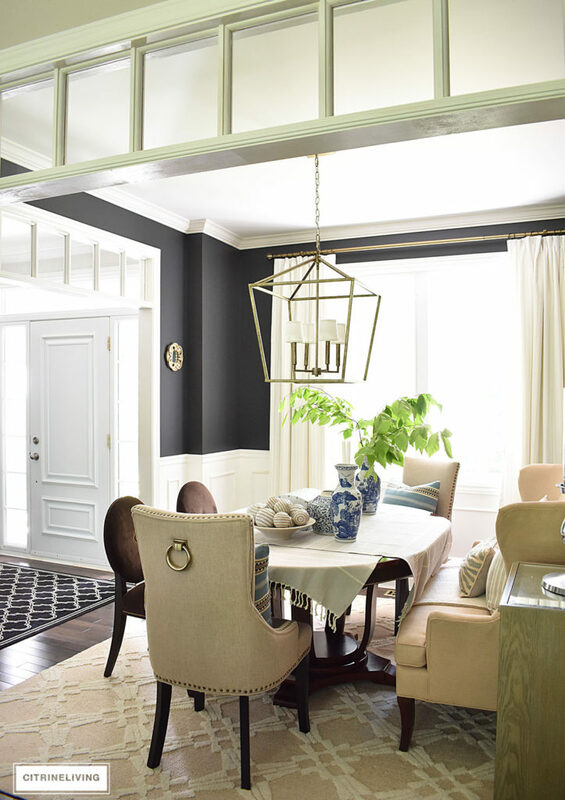 Very similar to my beach house colors, however you have that special touch. I would live to know where your purchased the kitchen and bedroom rugs. I couldn’t see to click on the image. Thanks! Would you please share the brand and where you purchase the table cloth.